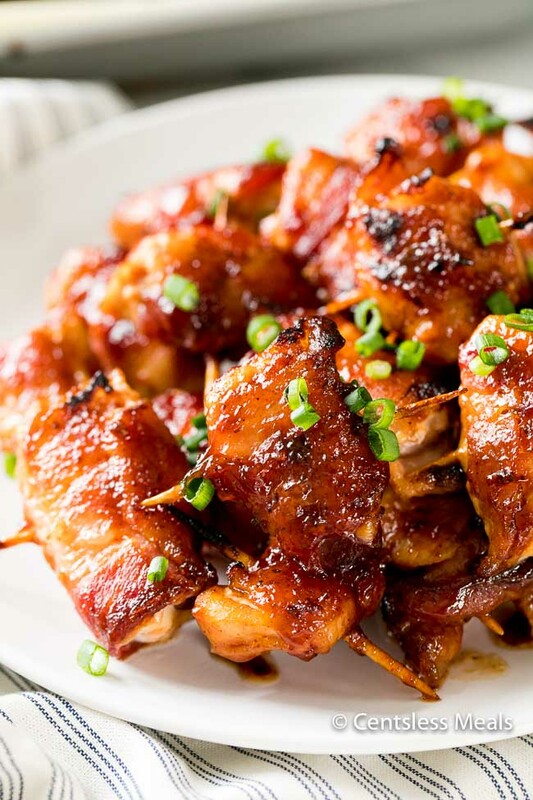 This Bacon Wrapped Chicken Bites recipe brings together two of my favorite food combinations, crisp bacon and tender juicy chicken! 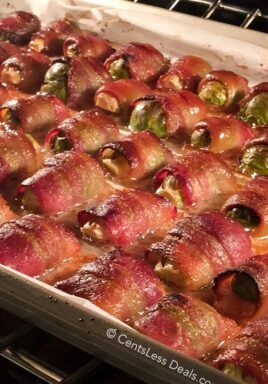 Smothered in a sweet bbq sauce and browned to perfection, this appetizer is mouth watering delicious! PIN IT to your Appetizer board to save it and share it! Be sure to follow CentsLessDeals on Pinterest! 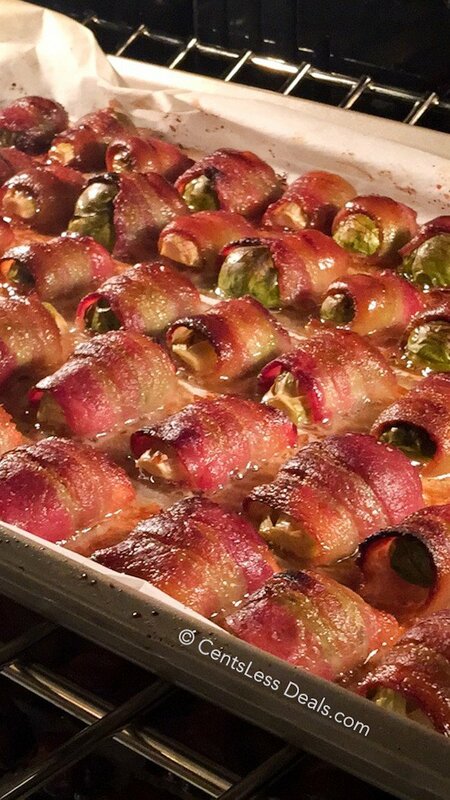 Not only is this delicious, but this appetizer is so quick and easy! 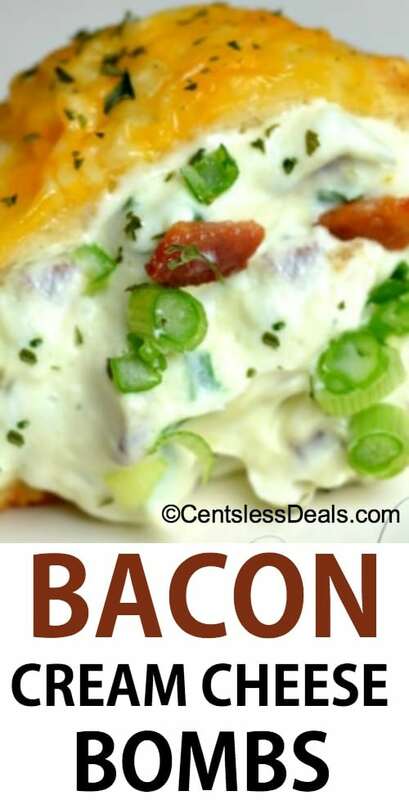 I love appetizers with bacon! Cut chicken breast or chicken tenders into bite sizes, wrap in bacon and secure with a toothpick. Simply smother in the BBQ sauce mixture and bake (or grill), what could be easier! You can make these ahead of time and store in the refrigerator. I have also made them and placed them in the freezer. I prefer to freeze them without the sauce so I can add whatever sauce I feel like at the time. You can however sauce them up before freezing if you choose. Be sure to use parchment paper to line your baking sheet when you are ready to cook. As tasty as these little morsels are, they are just as sticky and parchment paper makes clean-up a breeze! Another option is to cook these on the grill! Just simply cook them over indirect heat (to avoid flare ups) and turn them as needed. Keep a close eye on them because sugary sauces can char on the grill if you are not careful. One of my favorite things about this recipe is that you can modify it to your individual taste. 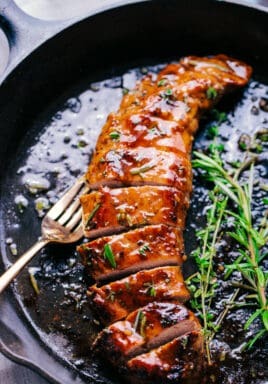 Use a BBQ sauce that has the right amount of heat for you.. Don’t be afraid to turn up the heat by adding some red chilli peppers or hot sauce creating a sweet and spicy bacon wrapped chicken bite! I love Sweet Baby Ray’s sauce! If you prefer a more mild flavor, simply use your favorite mild BBQ sauce. You can create an asian inspired chicken bite by adding sweet chili paste to the sauce. Or even substitute thai peanut sauce in place of the BBQ sauce which would be fantastic too! I have even made these with no sauce at all! I love to add fresh ground pepper to these tasty little morsels for a peppered bacon wrapped chicken bite. Try adding a slice of jalapeno encased with the chicken for an even spicier, more flavorful surprise in each bite! No matter what your tastebuds are craving, or even what you may have on hand at the time, the possibilities are endless! While this is a great appetizer, don’t stop there! 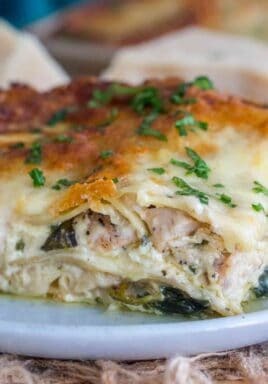 You could serve this with a fabulous salad like Easy Greek Salad or BLT Pasta Salad for a quick, delicious and complete lunch! 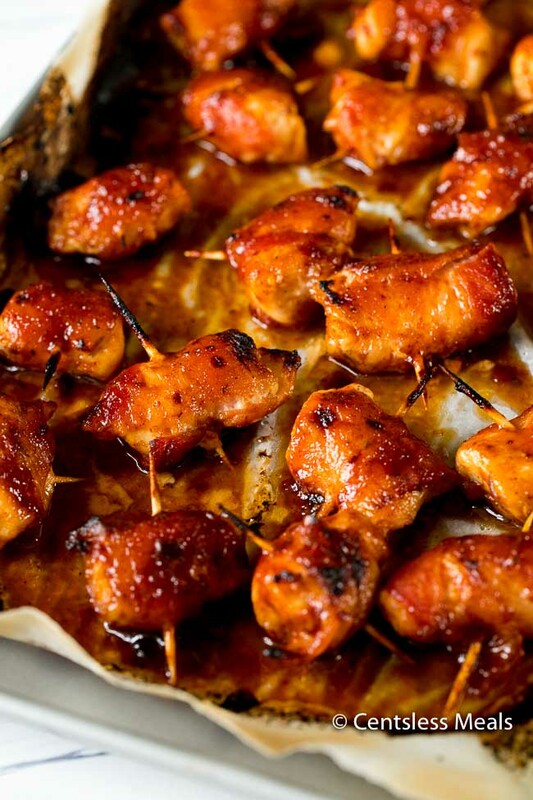 Sweet smoky bacon wrapped around tender chicken bites is the perfect appetizer. Cut chicken into 1 inch or bite sized cubes. Cut the bacon package in thirds. 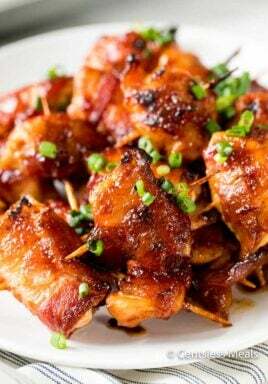 Take one cut strip of bacon and lay a cube of chicken on top. Roll the bacon/chicken up and secure with a toothpick. Combine the BBQ sauce with the brown sugar. Brush the roll ups with the mixture (see note below). Place the chicken/bacon rolls on a parchment lined baking sheet and bake for 10 minutes. Turn them over, baste with remaining BBQ sauce and place in oven for another 10-15 minutes or until cooked through. If you'd like a crispier finish you can broil for a few minutes before serving. When brushing the roll ups with the BBQ sauce mixture, it's best to do this before placing them on the parchment lined pan. 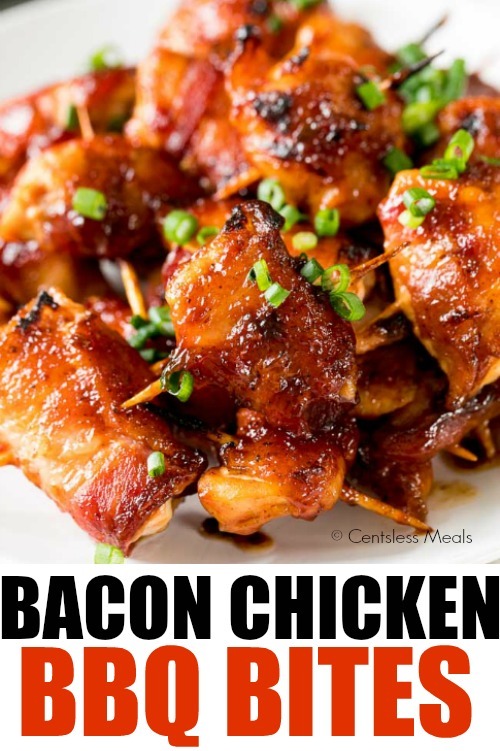 I have just made these ahead of time and have done the toothpick part and rubbed the bacon/chicken in brown sugar so far… I am wanting to cook them tomorrow. Do you think its safe to store them raw in the fridge together until tomorrow? I think it should work just fine Lexie. Enjoy them! maybe sprinkle with grated cheese when just out of the oven so the cheese doesn’t melt away,,,,it baked rather long I would think for chunk inside. Any chance you think adding some cut up block cheese would work well with this recipe?? ?